At the same time, that very tax collector, a state official who has used his position in order to gain a material fortune through deceit and at the expense of others, approached God in fear. With a bowed head he prayed to God “Lord have mercy on me a sinner!” Both of these men of stepped into the hospital for their soul, but only one of them will walk away healed. When we go to the doctor, do you do so to tell them how healthy we are? Or do we approach the doctor to say, "I am not well, help me become well!" The Pharisee approached the temple as an alcoholic drunk on his own pride, unable to recognize his own illness. In order to mask his own illness he chooses to pray with himself, to exalt his own accomplishments, so that he can receive the approval of other people. The Publican on the other hand, is aware of what ails his soul. He approaches the physician of our souls, and asks for healing, that he may not be exalted in front of others, but rather to be exalted in heaven. The publican, with fear to even raise his eyes up to heaven, prayed to God on his hands and knees, in a very similar manner as ourselves during the Lenten season with the many metanias that we do during the Lenten services. Metania, properly translated means “a change of mind.” As we are called this Triodion season to re-driect our attention to Chirst, we must also take an active role in changing our mind, our mode of thought, so that our hearts are aligned with the will of God. In order embrace this Metania and change our mind, we have recognized our weakness, and we have willingly approached God, asking him not only to forgive us, but to redirect our thoughts so that we are fully focused on him. If we say to ourselves, "this passage does not apply me," then we have already been deceived and pulled astray from Christ. Temptations begin small, and seemingly innocent. Some decisions will be justified in our mindset. The steps we take away from Christ are so small a subtle that we may not know what has happened before it is too late. The one who prays in humility and repentance is ever vigilant, however, constantly alert of the of temptations from the devil, and approaches God with sincerity, asking to be healed. Think of a time you have met a truly holy person. It is easy for us to recognize the Holy Spirit within them, there is a warmth and energy from them that draws us near to them. There is an attraction and an unconditional love that permeates from their very being that we cannot even explain. The Holy Fathers tell us that the Holy Spirit resides in us on the throne of our hearts. When we read about the saints of the church, or if we have ever encountered a truly holy person ourselves, it is immediately clear that this person has prepared a place in their hearts for the Holy Spirit to reside. As we begin our Journey to Great and Holy Pascha, we must take the time to really search within ourselves. We can complete all the tasks we are taught that we are supposed to do: attend the church services, fast from meat and dairy, and even say our prayers. However we have to approach our prayer introspectively and ask ourselves, why we are doing these things. Are we doing them simply because we have been told that this is what we are supposed to do. Are we doing these things to keep up appearances because others expect us to being holding the fast, because others expect us to be sitting in our pew? Or are we doing these things in order to build our relationship with Christ and grow closer to the Holy Spirit? Are we praying out of memorization and repetition, or are we praying to Christ, asking him to enter our souls and remove our sinful desires, opening the way to hold the Holy Light within us when we approach the feast of feast, Great and Holy Pashca? 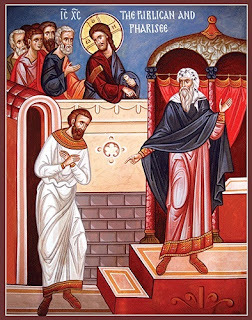 During this period of the Triodion, it is necessary for us to recognize the church as a place of healing, the church as the hospital of our souls. Let us lay our infirmities at the lord's feet this Lenten season and bend down in repentance asking for him to heal us. We need to put our trust in God, for we cannot succeed without his grace.